Along with Escapists, Thrill-Seekers are among the most voracious readers in my library. And like Escapists, Thrill-Seekers also love series books, especially high-suspense or horror stories. Easily bored, Thrill-Seekers do not tend to read the more realistic genres, preferring instead to keep their blood pumping with stories that could not happen in the world we know now. For this reason, Thrill-Seekers may also score high as Escapists and may have Escapist friends. 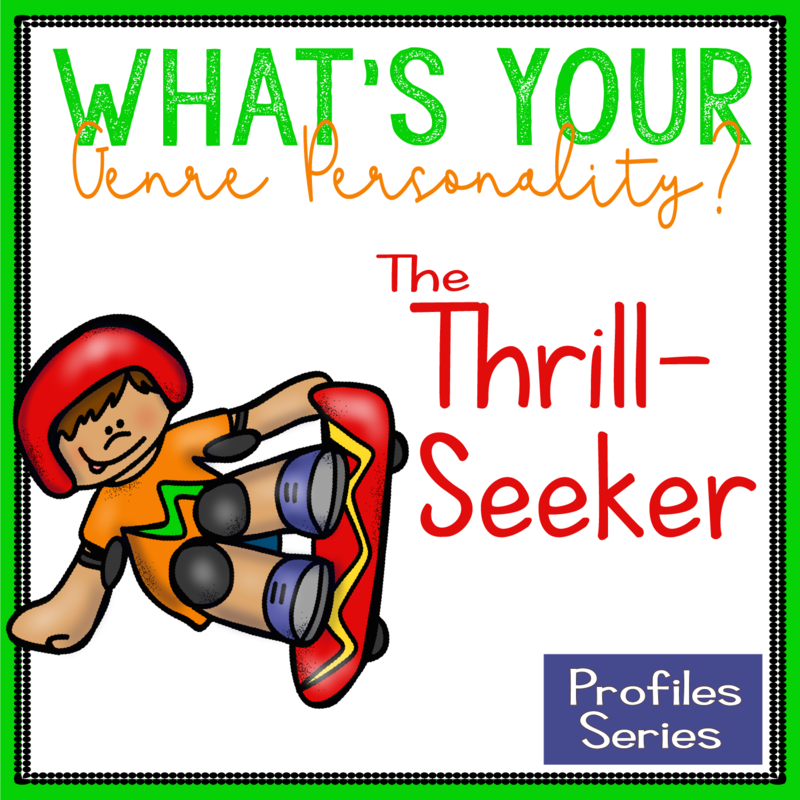 Description of the Thrill-Seeker (elementary version). The Thrill-Seeker is based on Michelle. Don't let those blue eyes fool you--this girl loves her blood and guts. She was constantly on a quest for the "scariest books" in the library, so I was constantly on the look-out for new YA horror titles for her. Michelle was one of many students who had two different families. Both her parents lived in the area, and both were remarried with another small child with their new spouse. This arrangement was probably difficult for Michelle, but I never saw her be anything but a kind, sweet young girl. Her grades were good, and she had many friends. But she sure loved her blood and guts, too! The Thrill-Seeker is Pete. Pete was a quiet kid who loved playing tennis and listening to The Beatles. Pete was wise beyond his years, and while he never talked about it, I suspect he had a difficult home life. He really loved books with darker themes, so our horror, science fiction, paranormal, and fantasy sections were his favorites. He loved Cinda Williams Chima's Seven Realms series, Jonathan Maberry's Rot & Ruin, and surprisingly, Kiersten White's Paranormalcy series. His best friend was Benjamin, who I profiled in The Escapist genre profile. The Thrill-Seeker is Christy. This name hasn't been changed--I love my Christy! Christy was one of my best friends growing up. We met when we were eight years old, and we are still friends today. We did EVERYTHING together, from bike riding to playgrounds to eating way too much candy to riding horses to skiing to roller skating to summer camp...I spent many nights at Christy's house, and I remember she always wanted to watch really scary movies. We're talking A Nightmare on Elm Street in like sixth grade. *shudders* I've read a lot of scary books in my time, but I have always secretly hated scary movies. And don't even get me started about how much that Ouija board of hers creeped me out! Christy always made me laugh with her scary MWAH-HA-HA laugh that I can still hear in my head today. Like Pete (above) and Ben, Christy and I are another Thrill-Seeker/Escapist friendship. Interesting! 1. Let them read what they want to read. Parents and teachers of Thrill-Seekers often worry that their teen is reading violent books. Granted, for teens with mental health issues, reading violent books or watching violent movies can exacerbate their conditions. But if your Thrill-Seeker is mentally stable--and the vast majority are--I see no reason to keep them from reading scary or violent stories. If they can handle the scary stuff without sleeping with their parents every night, then in most cases, you should let them read it. I read a LOT of Stephen King books in middle and high school. I read my first Stephen King book--Pet Sematary--in sixth grade, and I loved every gross, terrifying minute of it. It scared the heck out of me, and I went back for more, every time! Anyway, though my parents didn't worry about my reading horror at that age, I can remember an older family member telling me that I shouldn't read those books because that's how people got into Satanism. I may have only been 12 years old, but I was old enough to know that I wasn't going to "get into Satanism." I just liked a good, scary story, and I am so, so, so thankful that my parents never said anything like that to me. It bothered me that she said that, and I still remember it well, more than three decades later. If you are concerned about what your child is reading, no matter what their age, I would suggest reading the book with them. A discussion about books your child loves is always a good thing, and it could give you some insight into why they might like the scary stuff. Having a conversation is far better than just saying your child can't read the scary books they want to read. They may still read it behind your back, and you will have missed out on that valuable conversation. 2. Encourage them to write or tell scary stories. Thrill-Seekers may have a difficult time slowing down, so it is important that we help nurture their quieter sides. All three of my Thrill-Seekers above loved to tell scary stories. My Christy most definitely loves telling scary stories, and come to think of it, so does my Dad. I'm betting if he took this quiz, he'd be a Thrill-Seeker, too! Yet another reason I get along so well with my Dad! 3. Encourage them to stay active. Thrill-Seekers like action, and they may become easily bored. I listed several things above that I did with my friend Christy--horseback riding, skiing, riding bikes, roller skating--this is just a short list of the many outdoor sports activities I did with Christy. I do not remember ever playing video games with Christy or really even watching a lot of TV. We were always outside and very, very active. Thrill-Seekers innately love sports, especially extreme sports. Both Pete and Michelle were skateboarders. Michelle also rode horses, and Pete was a valuable member of the school tennis team. Sports are a good way for Thrill-Seekers to find the adrenaline rush they crave. Who are your Thrill-Seekers? Do you have a Christy in your life? 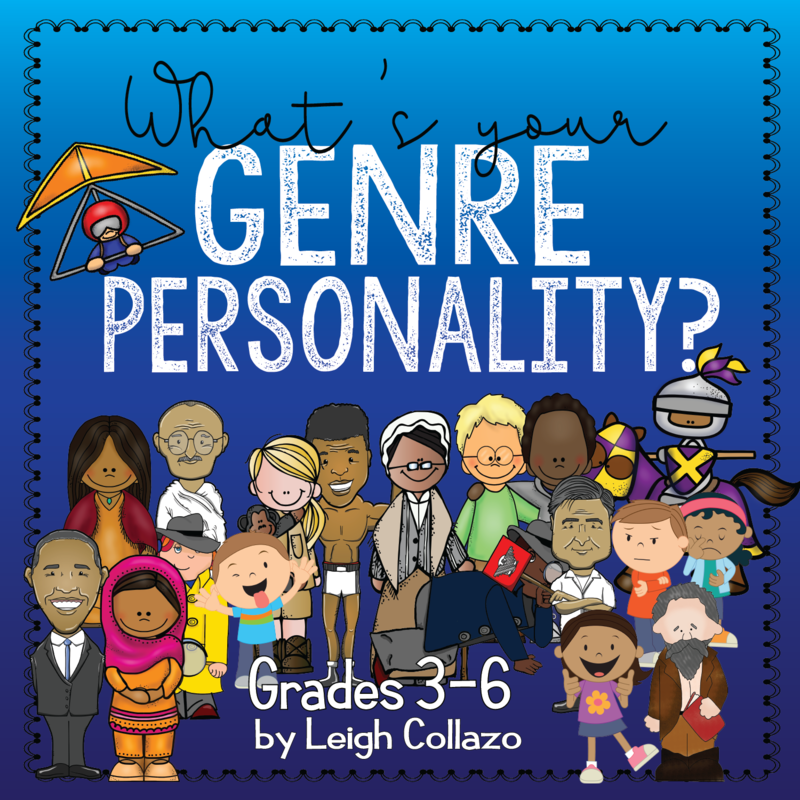 I love your blog, and this series of posts about Genre Personalities and with student profiles and recommendations to parents is absolutely excellent. I have been a secondary teacher for 9 years across 3 countries, and this fall I just started studying for a Master's in Teacher-Librarianship. One of my profs referred to your blog on a topic, and I have been following you ever since. Keep up the great writing! I appreciated it and am learning a lot. Hi, Shannon--I am so glad to hear! 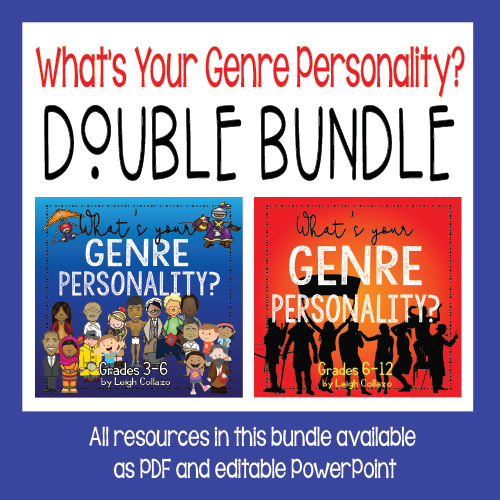 It's been quite fun working on the genre personalities! I gave the quiz again today, and the students were so cute, thinking I really nailed the personalities well. I love seeing their faces when we reveal their personality description! 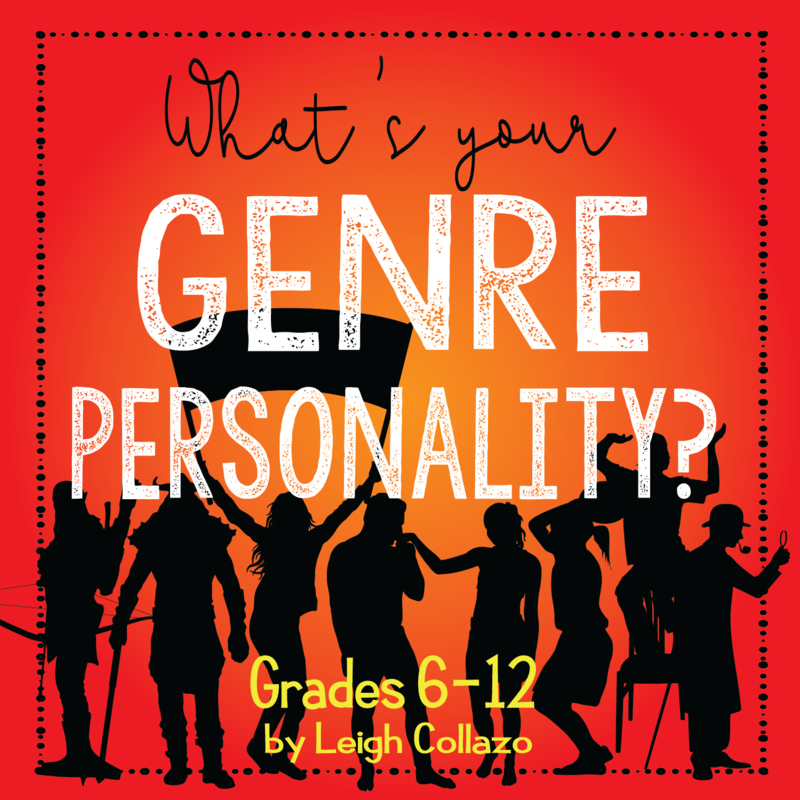 I'm loving the Genre Personality quiz and bookmarks. The link on this page doesn't take me to a download, and I can't find the Thrill Seeker bookmarks on your TPT page. Any help you can offer? Many thanks for these great resources! I can't get that either. But I just did the quiz lesson today and it was a hit! So much fun! I'd love to get the bookmark for Thrill Seekers. I have a bunch. Oh my goodness, I am so sorry about that! The link is now fixed. Thank you for letting me know!